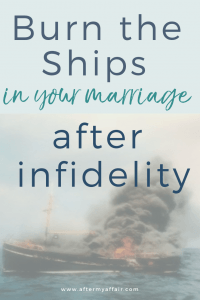 Making the decision to burn the ships in your marriage after infidelity. It was almost 12 years ago, but it might as well have been yesterday, I remember it so well. We sat in this older couples living room, on one of the darkest nights of our marriage. This elder from our church, and his wife, heard our story and invited us over. but our friends told them how dire our situation was, and they thought if they spoke to us, it would help. After we entered their house, we made small talk about the beautiful family pictures on the wall. One group photo was this couple with their adult sons, daughters, and grandchildren, all gathered around smiling for the camera. After the small talk, we made our way to the living room. We briefly explained the terrible mess of our broken marriage, and with my head hung low, I fully expected to be scorned and shamed. all others had expressed their disgust and disappointment in me when they heard our story. in a private meeting we all had. And what could I say in my defense for their rejection? What I did was horribly wrong, and shame had become my new unwelcome companion. (I don’t really blame anyone anymore for this, they each did only what they knew to do, and had the maturity to handle. I wondered, why would this meeting be any different? But I went with Jim to this couples house anyway, because we were desperate. We told Ron and Donna that we were trying to heal after my affair. But the previous 11 months of my back and forth with the affair partner made his trust in me beyond zero. Jim explained he didn’t know if he could continue doing this anymore. He was undecided if he would stay with me, or if we should divorce, although he still loved me and didn’t want to divorce. because of his own pain and vulnerability in wanting to feel better. But he couldn’t live like this, and I didn’t blame him. I knew in my heart that I was done with the affair, but how could he know? My affair fog was lifting, only to reveal the damage that I’d created in its place. I didn’t know how to move forward in healing with my husband that didn’t know if he wanted to stay married anymore. And he didn’t know if he could stay married to a wife who had lied so many times that all trust in me was gone. After explaining our situation, and then bracing myself for the shame that I knew would come… something happened. Instead of Ron looking at me in scorn over my past, he was looking to Jim to decide on our future. to not waver back and forth in indecision, keeping both of us, and our kids, in this uncertainty. Then Ron said something that we never forgot. He said “Jim, it’s time you put a stake in the ground right here, right now. You make a decision of what you want to do. Don’t keep her hanging any longer with your indecision of staying in the marriage or ending it. She can’t change the past, but you can both change the future. If you decide to end it, then tell her. Then he added, “and if you decide to move forward and work on your marriage, then burn the ships and don’t look back. You might have heard that saying before. Many motivational speakers, leaders and life coaches have said it in recent years. by fighting on their home soil; they were one of the most powerful military forces of their time. So, they burned the only resource they had to get out of there. . They had no other means of escape, they had to be all in or they’d die. This is how Alexander the Great was named because of how he led the Greeks to an amazing victory over the Persians. we left there feeling a renewed sense of purpose and commitment. It didn’t mean reconnecting with each other, and restoring my husbands trust in me was easy after that. Actually, it was still pretty difficult on most days. to not look back, but only find ways to conquer this attack upon our marriage…together. That decision was the first step in our restoration. It might have seemed uneventful to anyone else on the outside. I didn’t do everything perfectly after that night, and he didn’t either. Soon after that night of burning the ships after infidelity, I found a picture to commemorate that decision. The picture you see is framed and hangs on our bathroom wall ever since those early days. It’s our reminder that we’ve burned the ships. We won’t be using any alternate routes out of this, we’re committed to seeing this through. Some days, in the weeks and months after that night, I was still discouraged. It felt like the pain would never go away. I remember asking him if he thought we’d ever NOT feel like this someday. Would he ever trust me again? Would the affair ever NOT be the center of every thought and conversation we had, someday? I didn’t have those answers at the time. We only knew 2 couples personally that made it through an affair, that talked about it. What burning the boats (ships) in marriage meant for us. No waffling about staying married or getting divorced. We were going to see this through. Every married couple needs to make this determination regardless of infidelity, anyway. For me to have all contact with AP ended, cut off any future access, and get rid of any memorabilia I still had. of our marriage, based on how I was going to treat him and the commitment we made. Again, for me to not stay stuck in shame and to allow God’s forgiveness to take away the terrible shame I felt. of images his mind was tormenting him with. Ultimately, to burn the ships for us, meant we would be willing to do whatever it took to heal our marriage, and each other. and stay married, would all work out someday. Every week we made more and more progress, although I couldn’t always see it at the time. It’s like the saying goes “you can’t see the forest through the trees” we couldn’t see our progress with healing at the time. But after some time passed, we were able to take a step back and see how far we’d come. It’s like climbing a mountain, every step up that steep mountain seems hard as you try not to lose your footing. You don’t know how far you’ve come, because you’re so busy taking the next step, not tripping over any rocks to avoid stumbling. But then you make it to the top, and look back, and wow, you can hardly see the bottom of that mountain, where it all started. Healing from an affair, is a lot like that. And now, 12 years later, I can say it was the best decision we ever made. We’re both grandparents ourselves, and much like the picture I saw on that couples wall, it’s all because two people fell in love. We’re two broken, fallen people, but we absolutely love each other and want our story to give you hope for your marriage to be restored too. How can you burn the ships in your marriage? First, you must make the decision to start the journey to take that new territory in faith- (that your marriage that will be healed and restored). Then Burn the Ships–(stop looking for ways out of it). Be determined to not stay stuck in the areas that couples suffer setbacks in their affair recovery. (some common ones to be stuck are not forgiving the offense, if you’re the betrayed spouse. My next post will be How to reestablish trust again, how reconnecting with your spouse after an affair is possible. So, leave a comment below…in what ways do you need to burn the ships in your marriage? What’s holding you back from doing this? 17 common mistakes betrayed husbands make after their wife’s affair. 17 common mistakes unfaithful wives make after their affair. Hey there did you get your free gift? "7 Setbacks In Affair Recovery"
We'll never send you spam, we hate it too. Unsubscribe at any time.